Frente! was an Australian alternative pop/rock group, formed in 1991. 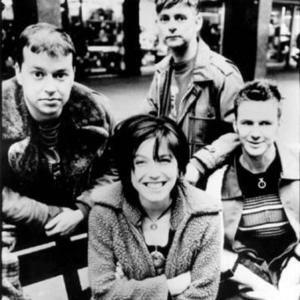 The lineup featured singer Angie Hart, founder and guitarist Simon Austin, bassist Tim O'Connor (later replaced by Bill McDonald), and drummer Mark Picton (later replaced by Alastair Barden). Frente! burst onto the Australian music charts with the singles "Ordinary Angels" and "Accidently Kelly Street" in 1992. Frente! 's debut album, Marvin the Album was also a success, going platinum in Australia. Frente! burst onto the Australian music charts with the singles "Ordinary Angels" and "Accidently Kelly Street" in 1992. Frente! 's debut album, Marvin the Album was also a success, going platinum in Australia. Frente's Indie sound and adult contemporary groove trudged through the mish-mosh of the mid nineties Grunge Alternative trend and came out on the other side, older wiser and squeeky clean. Untainted by the anger and aggresion of that era, Frente digs grooves such as hippy-friendly tunes like Accidently Kelly Street, and Most Beautiful. Marvin, The Album, glistened as what could best be described as an "album version" of a one hit wonder. Frente attained radio play recognition and a music video release with the single Labour of Love and followed it up with the remake New Order cover, Bizarre Love Triangle and Chris Knox cover, Not Given Lightly. Frente! released a second album, Shape, in 1996, but it didn't produce hit singles like their previous effort and hence sold poorly. Frente! broke up shortly after its release to pursue other projects. Angie Hart moved on to the pop duo Splendid, and later to the band Holidays on Ice. Her debut solo album Grounded Bird was released through ABC Music in September 2007.